The Autism Society Philippines continues its commitment to inclusive development through active participation and partnership with the various government units from the local to national -- such as the National Council on Disability Affairs. The NCDA is the national government agency mandated to formulate policies and coordinate the activities of all agencies concerning disability issues. As such, the NCDA has become a valuable partner to help steer the course of program development for persons with autism and other exceptionalities and the delivery of services to the disability sector. 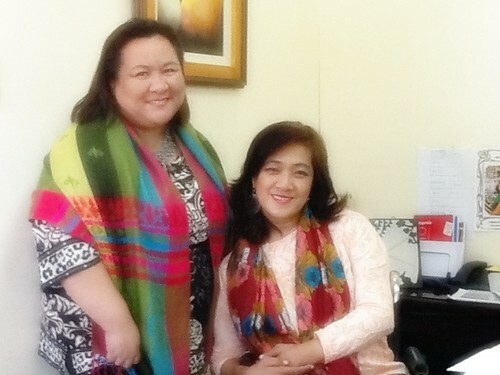 At the cusp of the commemoration of the International Day of PWDs in December 2014 and the National Autism Consciousness Week in January 2015, ASP National President Mona Magno-Veluz met one-on-one with Acting Executive Director Carmen Zubiaga last 07 November 2014 to review past engagements and align our future plans -- reinforcing both parties' continuous commitment to creating an autism inclusive Philippines. ASP will continue to be strongly represented by ASP Vice President Alejandro Cabason, reinforced by the participation of ASP Trustee Marivic Ramos, in the NCDA sub-committees on 1) Access to Justice, 2) Accessibility on Built Environment and Transportation, 3) Advocacy, 4) Auxilliary Social Services, 5) Education, 6) Health, 7) Information, Communications and Technology, 8) International Disability Network, 9) Training, Employment and Livelihood. ASP leaders, members and volunteers who have strong professional credentials to contribute to the advocacy effort and who are able and willing to attend weekday meetings to represent our organization at a national level may send a letter of introduction and resume to ASP National President Mona Magno-Veluz at autismphils@gmail.com.